As reported by us long back Vijay Sethupathi would be teaming up with the cinematographer of Naduvula Konjam Pakkatha Kaanom (NKPK), C Prem Kumar for a film. It must be noted that NKPK was based on a true life incident that happened to Prem. Prem will be making his directorial debut with this untitled film. Apparently, Trisha has been approached to play the female lead. We are told that the script demands an experienced actress like Nayanthara or Trisha. Now it looks like the team is planning to rope in the ‘Saamy’ actress to play that part. 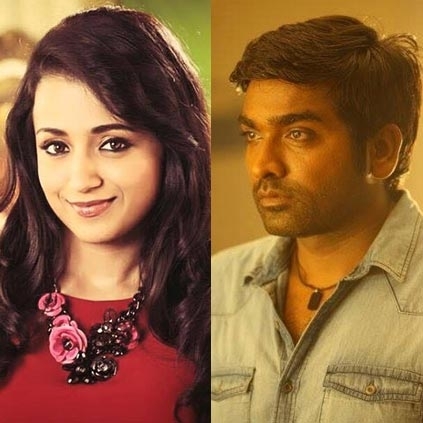 Trisha was also approached to act in Vijay Sethupathi-Vignesh Shivn project Kaathu Vaakkula Rendu Kaadhal. Since Vignesh Shivn is busy with Thaana Serntha Koottam right now, Kaathu Vaakkula Rendu Kaadhal might take some more time to take off. RJ Balaji’s laugh riot begins! Venkat Prabhu finishes off in style! A recent big Hollywood movie resembles an Indian movie, says Amy! What Is The Title Of KV Anand Vijay Sethupathi Project? People looking for online information on Trisha, Vijay Sethupathi will find this news story useful.